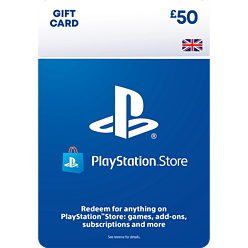 This £50 PlayStation Voucher allows you to purchase games, game add-ons, films and more from the PlayStation Network Store, accessible through your PSN Account on the PS4, PS3 and Vita. Use your £50 PlayStation Network Top Up to make in-game purchases. For the ultimate Fortnite players, you can redeem the wallet top-up into Fortnite V Bucks to purchase emotes, skins and much more. • This voucher code is issued by Sony Interactive Entertainment Network Europe Limited.